Life is good for university friends Sarah, Ruth, Charlotte and Kathy - it's summer, exams are over and they're escaping to a cabin by the Blue Pool. But then Sarah disappears without a trace. This is a cracking read/listen and the narration is a joy. Aoife McMahon does an really impressive job here in voicing the various characters, their moods and tones. The writing isn't faultless by any means, but the characters are all engaging and it is a great tale. Unlike some other books around in this genre, far from fizzling out a little towards the end, this was a relatively slow burn in the early chapters in order to provide much needed background to the later events. The story was always engrossing, but the last third or so romped along to a very satisfying ending. 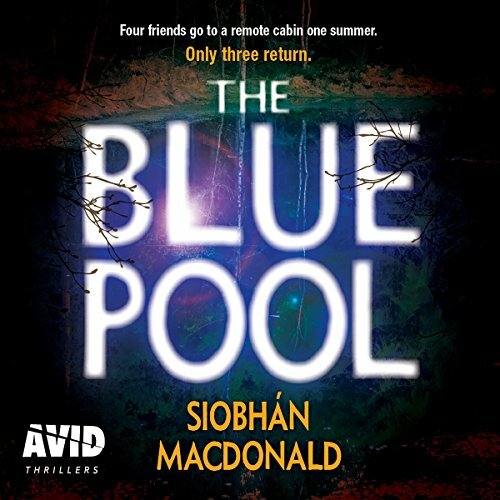 Where does The Blue Pool rank among all the audiobooks you’ve listened to so far? This ranks as one of the very best....one I WILL read again, and again.. Terrific work by the narrator too. This story really grabs you and you absolutely cannot wait to find out what really happened! The ending packs a very unexpected punch too. What was one of the most memorable moments of The Blue Pool? This novel is so well written that it stays on in the memory for ages after finishing it. I simply wouldn't even want to try and dissect it into its' most memorable moments. That would probably detract from its' overall quality. We all have hidden depths- but some are fathomless! Thanks to Ann of Newcastle for recommending this novel. What a shame it hasn't yet found the fame on Audible that it so deserves. I am now about to buy Twisted River by Siobhan MacDonald who is a superb novelist, if this one is any measure. This novel lasts almost 11 hours and NONE of it wasted or padded out at all. It all matters and adds to the overall quality of characters and plot. Would you consider the audio edition of The Blue Pool to be better than the print version? I did find moving backwards and forwards in time a little confusing - but I did enjoy the story. This is the 3rd book in a row that I've returned within an hour or two of listening and I don't actually consider myself that fussy! Unfortunately the many positive reviews didn't translate into s positive experience for me, although it does sound as if there's a good ending. Not for me though! I found it hard to differentiate between the four women, I think due to both the writing and narration. And I didn't care for any of them although the descriptions of the student house were very reminiscent for me. Hoping the next book I choose off my wish list is a better fit. I am missing the luxury of having a great audiobook listen to squeeze in whenever I can. Dog walks, runs and car journeys not nearly so much fun. I downloaded this book after reading a positive recommendation from another reviewer. for some reason I just couldn't get into it. the first part of the book is very slow and the narration isn't brilliant, I struggled to differentiate between each character. the end was quite good but I still found my mind wandering at times. I thoroughly enjoyed this audiobook. The story was well written and the narrator was excellent. It started out seeming a bit slow but the writer really had to make all four girls different and believable. This wasn't one of those books filled with red herrings. In fact I genuinely had no idea who the culprit was until the very end of the story and it was a great twist to end on. Definitely worth a listen. Life is too short to read all the good books in the world without tediously slow books like this. I agree with another reviewer of this book that it is becoming very difficult to find a good book at the moment. I have returned so many books that I am embarrassed. Still, this is another one for the return pile. Sorry Audible. Sarah as she was a free spirit and fun. Also torn between her dreams and her parents. I was shocked by the ending. I then went back and re-listened to certain parts and was really impressed by how clever the writing was. I didn’t think I was going to enjoy this book. Whilst it was a little fantastical, the twist surprised me. The narration was strong but at times just lagged a little. First of Siobhan's books I have read. The way the author moves between then and now made me wish I had a perfect memory and could remember earlier conversations. A delight to listen to and had me enthralled. Wasn’t too interesting in the first parts & didn’t find the story intriguing so would have given 3 stars. The end was definitely unexpected & then couldn’t wait to find out what happened. I’ll have to listen again, this time knowing the information might make it better. Loved it although it seemed to take a while for me to get into the story- a little slow at the start - love narrator Aoife McMahon - she’s my favourite narrators. The Blue Pool is an intriguing thriller that leaves you wondering right to the end. I loved the twist that changes everything. The narrator is very easy to listen to and makes the story real. If you could sum up The Blue Pool in three words, what would they be? When it was disclosed that Charlotte was the guilty party. I loved Cathy. She was totally believable.